Welcome to another edition of garden bloggers bloom day. This is a monthly event hosted by Carol at May Dream Gardens. Visit her website for some intriguing flowers blooming all around the gardens. Let me share with you pics of Sweet almond verbena, gram blue butterfly and skipper butterfly. This is my second year growing sweet almond verbena, botanic name aloysia virgata. This year i pruned it hard in the last december and the results showed in form of more blooms. I deadheaded every bloom and it kept blooming and blooming. Every butterfly of the area and every bee visited these blooms having strong almond fragrance. 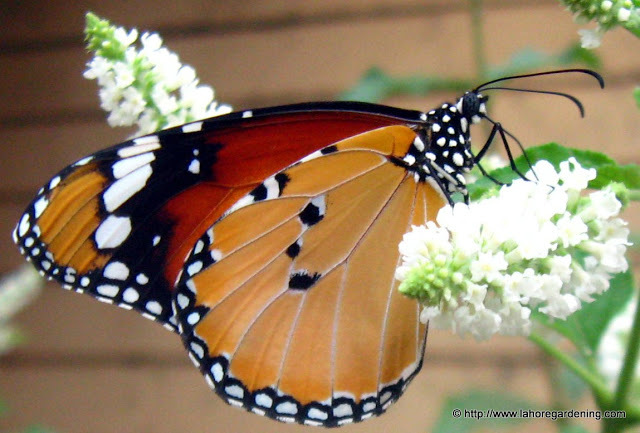 The first one is plain tiger butterfly with common name african monarch and biological name danaus chrysippus. A very common butterfly from asia and africa found abundant in lahore pakistan. This is Small branded Swift Skipper with biological name Pelopidas mathias. 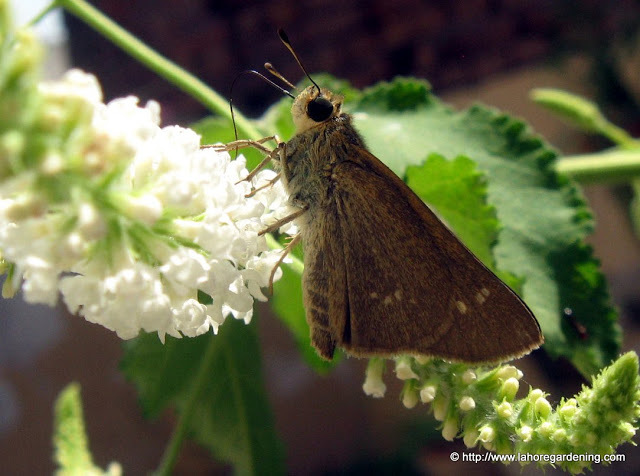 No other insect is so fond of sweet almond verbena but this skipper butterfly. There were more than 15 beauties luring over the blooms at one time. Another bee but i am not sure which one it is. She is the one which stays still in air for a long time. This is gram blue butterfly with biological name (Euchrysops cnejus).She is mostly after pea related flowers but this time she could not resist the fragrance and nectar of these sweet blooms. Another common bee of our area. She loves murraya and any sweet smelling plant. She is the last one to leave the flowers of this sweet almond bush. 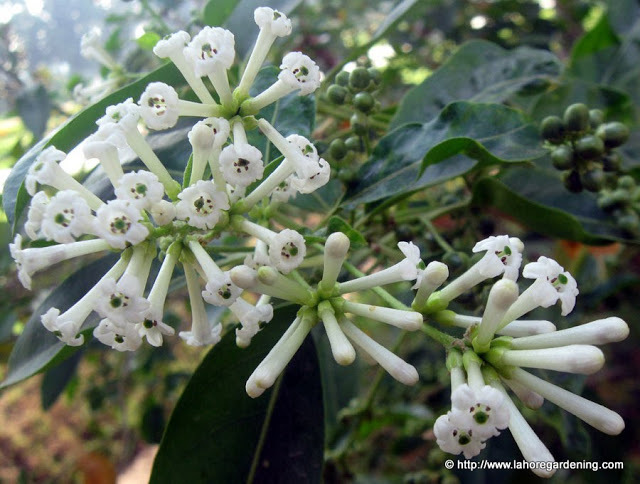 And last but not least, this sweet smelling flowers are no other than cestrum diurnum also known as Din ka raja. Unlike its cousin cestrum nocturnum it releases its scent in daytime. and Stuff. Do visit her blog for some enchanting blooms. Nice pictures of white flowers! I love it! I love the insect shots. You must shoot very fast. Great shots … the Tiger butterfly is gorgeous and so is the Gram Blue. Lovely clear close-ups. The Cestrum is simply beautiful as well. Wonderful shots! Bonus points for insects on flowers!!! Excellent images – the tiger butterfly photo is especially beautiful. lots of life going on in your garden! I bet that fragrance is heavenly. Beautiful shots of the butterflies and bees! And love the flowers they are enjoying! Lovely pictures. I am growing Cestrum nocturnum in a pot. I had not realised a day fragrant one existed. It sounds worth a try and the flowers look more distinctive. Gorgeous images. Love the insect models. Beautiful bees and butterflies. You are a brilliant photographer! what a very nice tour of your garden this morning, i enjoyed the macro insects, the details are amazing. Love the pics of the little critters in your garden! That Tiger butterfly is very special. Nice to have found you via Carol’s site. Happy Bloom Day! Really lovely photos of all the small critters in your garden. Have a lovely weekend. The colourations on the tiger butterfly were so lovely. Thanks for sharing. 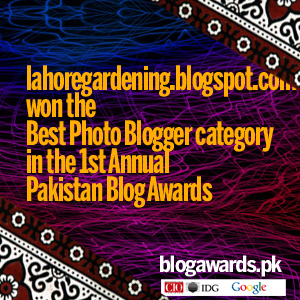 Your blog is like going on an international garden tour. I wish I could smell all of the flowers! Beautiful photos of all the butterflies. I recently heard someone else talking about this plant and raving about it…I may have to look it up…thanks for the post! Zone 10? Lucky! We are now experiencing cooler temps and less flowers as a result. 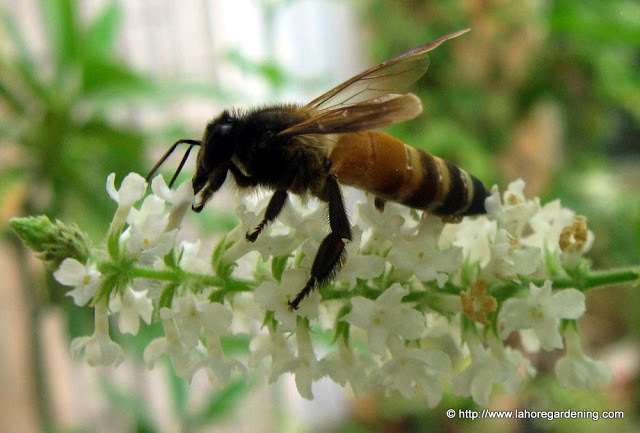 Love your bees, butterflies and flowers on this bloom day. 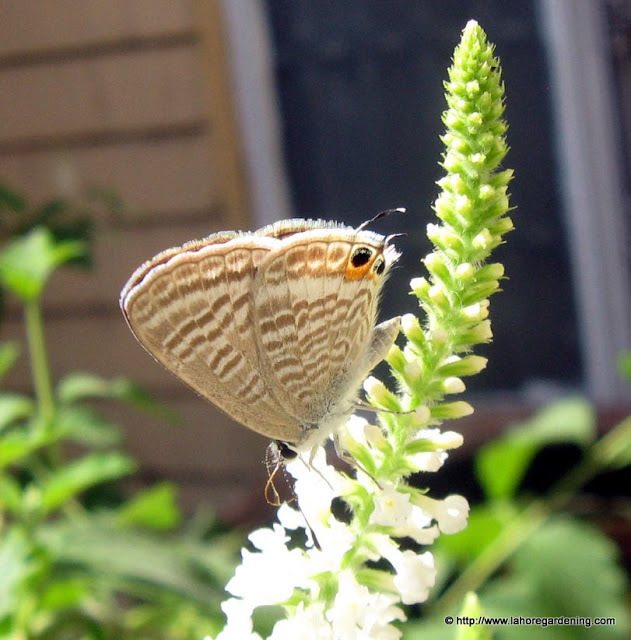 Love your shots of the beautiful plants and the critters! Amazing pictures…insects and flowers. Perfect match. 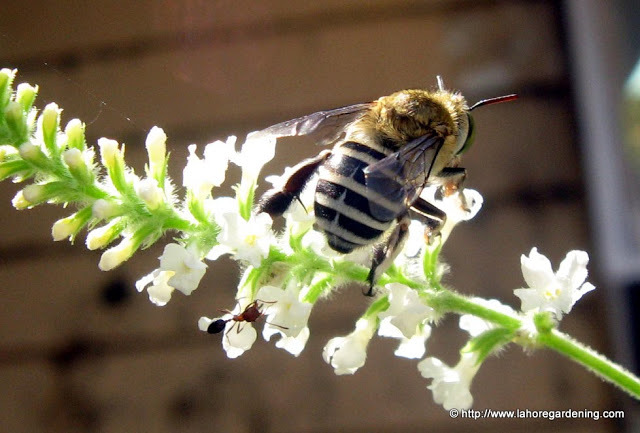 Your garden insects are as lovely as your garden blooms. Fascinating to discover another part of the gardening world. Great close ups! You have some interesting bees there, especially the one with the long body! Thank you for paying a visit to my blog, The Gardening Life. Have a great weekend. Entomologists eat your heart out!